About a third of the world's fish stocks are being overfished, meaning they're being harvested faster than they can reproduce, and species that spawn seasonally in large groups are especially vulnerable, easy for fishers to locate and plucked from the water often before they've seeded the next generation. 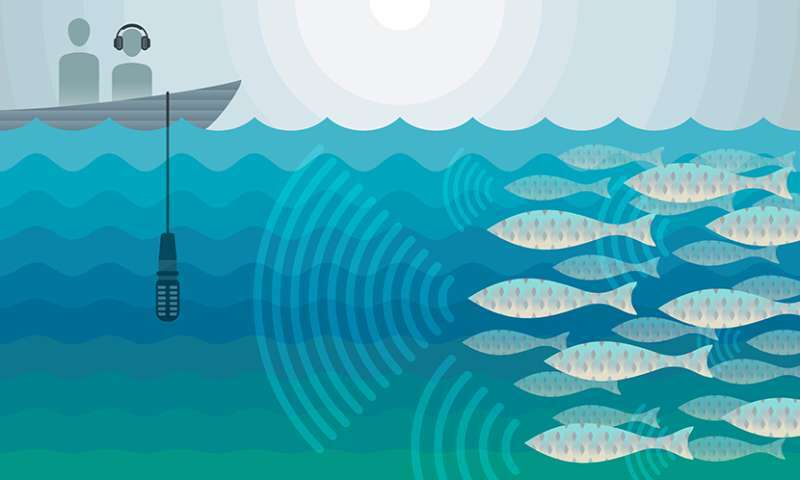 A team led by marine scientists from The University of Texas Marine Science Institute (UTMSI) and the Scripps Institution of Oceanography have discovered a way to use the incredibly loud, distinctive sounds that fish make when they gather to spawn—not to catch them but to protect them. The team developed an inexpensive yet accurate method for estimating how many fish are in a spawning aggregation, based on their mating calls. Accurate data on when and where fish spawn, as well as how many there are, would help fisheries managers design effective management practices and monitor the ongoing health of a fishery. "It can be extremely challenging to get a complete picture of fish spawning events because they can happen over very short to very long times and are often in difficult environments such as murky water," says Brad Erisman, assistant professor at UTMSI and co-author of a study published June 13 in the journal Scientific Reports. "Our work opens an acoustic window into these exciting spawning events." The paper's lead author is Timothy Rowell, a graduate student of Octavio Aburto-Oropeza's at Scripps. The researchers developed the method specifically for the Gulf corvina, a popular fish in Mexico's Gulf of California, but it can be adapted to any fish that make courtship sounds such as cod, groupers and croakers, including the endangered totoaba, a species that is also endemic to the Gulf of California. Each spring, the entire adult population of Gulf corvina—more than 2 million fish—migrates to a small area at the northern tip of the Gulf of California. When the males start calling to attract mates, the sound is deafening. Using underwater microphones called hydrophones, Rowell discovered that these fish can make sounds up to 192 decibels—enough to damage your eardrums if it were on land. "It's louder than a rock concert," says Erisman. "It's louder than standing less than a meter from a chain saw." Hear the spawning sounds of the Gulf Corvina and learn more about the research from: "Can Sound Save a Fish?" All that noise is dangerous to the fish, too, because it leads fishers right to the corvina spawning aggregations. Over about 20 nights each spring, they can harvest more than a million fish with minimal effort. Because the entire species spawns in one place, they are extremely vulnerable. Until now, it has been difficult to monitor the population, but there is anecdotal evidence that illegal fishing is on the rise and that the fish being caught are getting smaller over time, both signs that they might be overfished. "Over-harvesting from the aggregation site could result in the functional extinction of the species in the ecosystem, which would have negative effects on the local economy and cause the fishery to collapse," says Rowell. "This is why sustainable harvest levels need to be set. At the moment we do not know what these levels are." Rowell and Erisman's new acoustic method for monitoring spawning populations could help ensure that corvina fishing is sustainable in the long run. "The fishers are by no means the enemy here," says Erisman. "They're actually the ones who have provided us with all the information and access to the resource, and they're the ones most interested in sustainability." Erisman and Rowell are part of an international research group, the Gulf of California Marine Program, that has created an interactive online tool called dataMARES where anyone can study how corvina populations are changing. And those who fish, fisheries managers and conservationists can now do a better job of keeping corvina populations sustainable. "The idea is we try to bring all the stakeholders, different groups that have a vested interest in the fishery and the environment, together to try to work it out," says Erisman. "And it's nice that science is playing a role in that."